The TV start times for NASCAR Sprint Cup Series races, at least those on the Fox Network anyways, look like they will remain the same in 2011. The Observer and ThatsRacin.com have obtained the approximate green-flag start times of all the Cup races that will be broadcast on Fox and they all generally follow the same 1 p.m.-3 p.m.-7:30 p.m. Eastern start time slots of 2010. NASCAR CEO and Chairman Brian France said during the season finale race weekend in Homestead, Fla., that the sanctioning body was looking at several areas that could be affecting poor TV ratings in 2010, including start times. According to the information obtained, the Budweiser Shootout is scheduled for a green-flag start at 8:29 p.m. Saturday, Feb. 12. 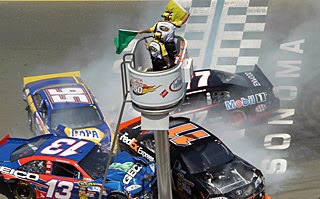 The 2011 Daytona 500 is scheduled for a 1:19 p.m. green-flag start on Feb. 20. 3:16 p.m. Eastern March 27 at Auto Club Speedway in Fontana, Calif.
1:13 p.m. Eastern April 3 at Martinsville, Va.
1:19 p.m. Eastern April 17 at Talladega, Ala.
7:44 p.m. Eastern April 30 at Richmond, Va.
7:45 p.m. Eastern May 7 at Darlington, S.C.
1:15 p.m. Eastern May 15 at Dover, Del. Jennifer Jo Cobb to appear on CNN's "Anderson Cooper 360"
NASCAR Camping World Truck Series driver and team owner Jennifer Jo Cobb is scheduled to appear on CNN's "Anderson Cooper 360" this week to discuss extreme living with Dr. Sanjay Gupta. The interview was recorded in New York City on Dec. 21 and set to air on Tuesday. The interview will focus on the on-track and off-track exploits of the driver's lifestyle as a team owner and driver in the Truck and Nationwide series. "This was a great opportunity to discuss the lifestyle associated with a NASCAR driver. Most race fans only see what takes place at the race track. They don't get to see what we're like when we aren't at a speedway," she said. "I get lots of questions about what I do in my spare time and what I enjoy doing when I'm not racing. Hopefully this will give the folks at home some insight into the sport, and what drivers are all about." -Looks like Todd Gordon, who spent this season as race-day engineer for Diamond-Waltrip Racing's NASCAR Nationwide team, will become the new crew chief for Penske Racing's Brad Keselowski in the Nationwide Series. Gordon joined Diamond-Waltrip in January. Keselowski is fresh off winning the series championship with help from an astounding 26 top-five finishes in 35 races. His crew chief in the series this season, Paul Wolfe, moves to Keselowski's Sprint Cup team in 2011. -Roush Fenway Racing recently named Steve Newmark as its new president. Newmark will succeed Geoff Smith in the position; Smith is retiring at the end of this month after serving in the role for 13 years. Newmark, who previously was a shareholder at the law firm of Robinson, Bradshaw and Hinson, joined the organization as senior vice president of business operations in April. "We are excited about Steve coming on board as our president," said Roush Fenway owner Jack Roush. "Steve has a solid background working in all areas of sports and brings new ideas and insight into our organization. Importantly, he has been part of the Roush Fenway family for many years, beginning as outside counsel and then as head of our business operations this year." -Book and comedy tours, welcoming an action sports star to NASCAR, tons of television work and a return to racing are on tap for the 47-year-old Michael Waltrip as he begins his second full season of what he calls “semi-retirement.” Waltrip's first book, "In the blink of an eye," debuts in February and his "Michael Waltrip Comedy Garage Tour" begins its second season. Motocross and X-Game star Travis Pastrana will run seven Nationwide races this season with a team co-owned by Waltrip. Waltrip will continue his TV work on Camping World Truck Series broadcasts on Speed as well as on Showtime's "Inside NASCAR" program. Waltrip will still be racing as well, joining MWR co-owner Rob Kauffman in a Ferrari sports car in Portugal, Dubai and other tracks across the globe. 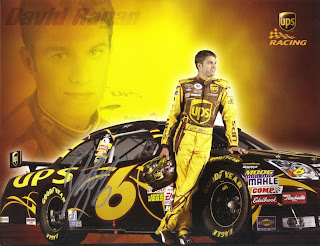 He’ll also compete in the 2010 Daytona 500, the new race at Kentucky Speedway and possibly a few more. HBO is in the process of producing a new mini-series, "To Appomattox," which will be based on the Civil War-ending final battle at Appomattox, Virginia, and cover the surrender of General Robert E. Lee to General Ulysses S. Grant. HBO is rounding up a star-studded cast to participate in the more than 50 speaking parts, including a search for NASCAR drivers to take some of the roles. The network has already landed one - Sprint Cup Series driver Carl Edwards, who is scheduled to play the role of Gen. John B. Gordon, a Confederate General selected by Lee to surrender the Army of Northern Virginia. Among the others lined up for prominent roles are Michael C. Hall as Gen. Grant; William Petersen as Gen. William. T. Sherman; Will Patton as Gen. Lee; and the group Rascal Flatts will produce the soundtrack for the series. Production is set to begin in the spring of 2011. No date as been set to air the series as yet. To read more about the mini-series "To Appomattox," go here. 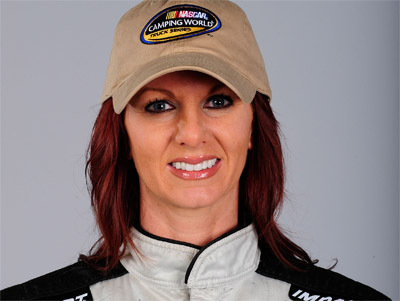 To read more about why the series is looking at NASCAR drivers, go here. Members of the National Motorsports Press Association have selected the late Jim Hunter as the fourth quarter winner of the NMPA Speedway Motorsports Spirit Award. The award is designed to recognize character and achievement in the face of adversity, sportsmanship and contributions to motorsports. Each year, quarterly winners are selected, and an overall winner is determined by a vote of the NMPA membership. Hunter, who died Oct. 29 after a yearlong battle with cancer, epitomized the spirit of NASCAR throughout his lengthy career in the sport. 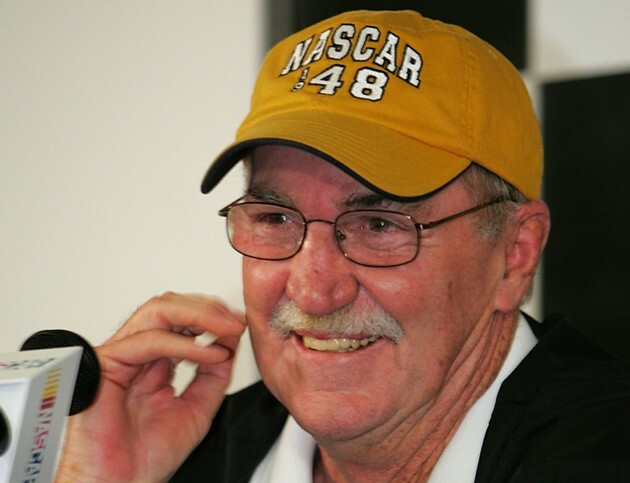 He worked as a journalist, public relations representative, president of Darlington Raceway and NASCAR executive. Through his role as NASCAR vice president of corporate communications, Hunter served as a liaison between the sanctioning body and the press, and was considered a close and trusted friend of both. Also receiving votes were: Atlanta Motor Speedway Director of Marketing and Promotion Marcy Scott, NASCAR Camping World Truck Series owner/driver Jennifer Jo Cobb and NASCAR Sprint Cup Series champion Jimmie Johnson. Bobby Hutchens, competition director at Stewart-Haas Racing, won the award in the first quarter, J.D. Gibbs and his family won the honor in the second quarter and Sprint Cup driver Brian Vickers won the third quarter Spirit Award. It really shouldn't come as a surprise that Jimmie Johnson was the best when it mattered most again this season. Over the course of the 10 Chase for the Sprint Cup races, Johnson, who won a NASCAR-record fifth consecutive championship, scored the most points of any driver - 1,572. And remember, he entered the Chase with a slight deficit to Denny Hamlin, who was the No. 1 seed based on wins at the time. Also no surprise is that the drivers who finished the season second and third in the series standings - Hamlin and Kevin Harvick - also did well in the Chase. Harvick scored the second-most points and Hamlin third. But there were some surprises. Four drivers not in the Chase - Mark Martin, Joey Logano, Jamie McMurray and Ryan Newman - ranked among the Top 10 in points scored over the final 10 races, with Martin the best among that group. He scored the fifth-most points in the final 10 races. Note: For those who like to play the "what if" game. Had Clint Bowyer not received a 150-point penalty from NASCAR for his car failing inspection at the R&D Center following his win at New Hampshire, he would have ranked No. 7 with 1,305 points. Is the NASCAR banquet over yet? I can't be certain myself, since I stopped watching, but I assume the Sprint Cup Series awards banquet is over by now. Someone please correct me if I'm wrong. Having attended many banquets in person, I can tell you a lot of very well-meaning and smart people do all they can to try to make the evening go as smoothly as possible in hopes of providing an entertaining and enjoyable night recognizing NASCAR's best performers of the season. And they fail every year. It's not their fault, though. The banquet is just a glorified dinner party. It's just not designed to be an entertaining event. Think of the all the business-related dinner parties you've attended. They all have fancy menus, strange-looking desserts. They generally feature some people trying to crack jokes in hopes of lightening the mood. The speeches you are actually there to hear turn out to be generally stale, non-controversial and read word-for-word from a script. That's basically the Cup awards banquet. Was it boring? Yes. Was it too long? Yes. But it was what it was - a glorified dinner party. Those who got disappointed or angered because it was not something more were simply working with unrealistic expectations. That's not the fault of the people televising the event; it's the fault of the event itself. Until the banquet becomes something filled with announcements or award winners that the NASCAR world does not know ahead of time, it's never going to be what some who watch wish it were. A different camera angle or different commentators isn't going to change the fact there is little at the banquet worthy of true entertainment. It's a high-dollar dinner party. Nothing more. Nothing less. And it's over. I think. Is TV in love with Jimmie Johnson? Jimmie Johnson didn't just win a fifth consecutive Sprint Cup Series championship this season, he also dominated his competition in another way - in TV exposure. According to research conducted by Joyce Julius & Assoc. Inc. - a sports and entertainment industry leader in measurement and evaluation of sponsorships and promotional programs - Johnson was interviewed an entire half-hour longer and mentioned 1,800 more times by the announcers than series runner-up Denny Hamlin throughout the course of the season. The research by Joyce Julius, which has monitored every NASCAR race telecast for the last 25 years, Johnson's name was mentioned 7,875 times during the 36 live event telecasts (and replays) of the 2010 season. Johnson also appeared in a season-high 88 interview segments, which added up to over 1 1/2 hours of television time. Hamlin, by contrast, drew 6,072 announcer mentions and 56 interviews that totaled just over an hour of TV time. Hamlin won the most races this season and lead the Chase for the Cup going into the season's final race. According to the research, Kyle Busch was the third-most mentioned driver, Kevin Harvick was fourth and Jeff Gordon fifth. Ragan heads to Snowball fight in Fla.
David Ragan, driver of Roush Fenway Racing's No. 6 Ford, begins his off-season from NASCAR racing by competing in the Snowball Derby, a 300-lap Super Late Model stock car race held annually at the 1/2-mile Five Flags Speedway in Pensacola, Florida the first weekend of December. Fellow Cup driver Kyle Busch won the event last season and many NASCAR veterans from Rusty Wallace to Darrell Waltrip have won the race in the past. "I have never been down there, and I have built a late model car over the last off-season just to go race around the Southeast and I thought, ‘Heck, let’s go down here and run it,’ ” Ragan said. Ragan said he has no illusions of going down to the Derby and winning just because he's a Cup driver, but he does enjoy another opportunity for competition. "The first Cup off weekend in December there is usually no racing going on, so this is the perfect time of year to go race. It is the best of the best of short track racers down there. It is going to be a challenge," he said. "If it was going to be a cake walk I don’t think anybody would want to go down there. It is a tough race. For me, it is all about learning something else, being competitive and seeing what I’ve got." Besides more racing, is there anything else Ragan likes to do in the brief NASCAR offseason? “The biggest thing is to spend time with my family. So much over the racing season they are always second or third," he said. "Anytime I can spend some time with my girlfriend or go back home to Georgia and spend a few weeks seeing my grandparents really means a lot. "Once Daytona rolls around we are testing and I just don’t get a chance to see them."